Emily will be completing her Master’s of Science degree in December 2017. She received her undergraduate degree in Marine Sciences from SBU, with diversifying minors in geospatial science (GIS), coastal environmental science, and theatre arts. Emily was drawn to Dr. Janet Nye’s quantitative fisheries ecology lab for her graduate studies because Dr. Nye’s lab tackles big picture questions of socio-political relevance. As environments change, we must be able to predict how fisheries stocks will respond and how stakeholder lives will be affected. Her thesis work evaluates distributional change in two ecologically and economically important migratory demersal fish (summer flounder (Paralichthys dentatus) and Black Sea Bass (Centropristis striata)) at different life stages, in response to climate change along the northeast US coastline. The study relies on problem visualization, modeling and database skills (in R, Matlab, and ArcGIS), and effective data presentation for stakeholder assessment. Over her years at SBU, Emily has helped to promote an appreciation for science and expanded opportunities for discussion among her peers, the larger university community, and the public. In addition to her academic work, she has also served as a member of the School of Marine and Atmospheric Sciences graduate student organization, as the secretary of American Fisheries Society Student Subunit, and as the treasurer for the Graduate Women in Science and Engineering (GWISE) club. She is also a member of the STRIDE and IACS programs at SBU. After completion of her masters degree, Emily will move to Washington DC to serve as a 2018 John A. Knauss Fellow (Link) from New York. A Knauss Fellowship will allow her to combine these experiences and interests and to begin to develop a career in policy-relevant science, addressing global issues concerning the governance of our coasts and oceans. 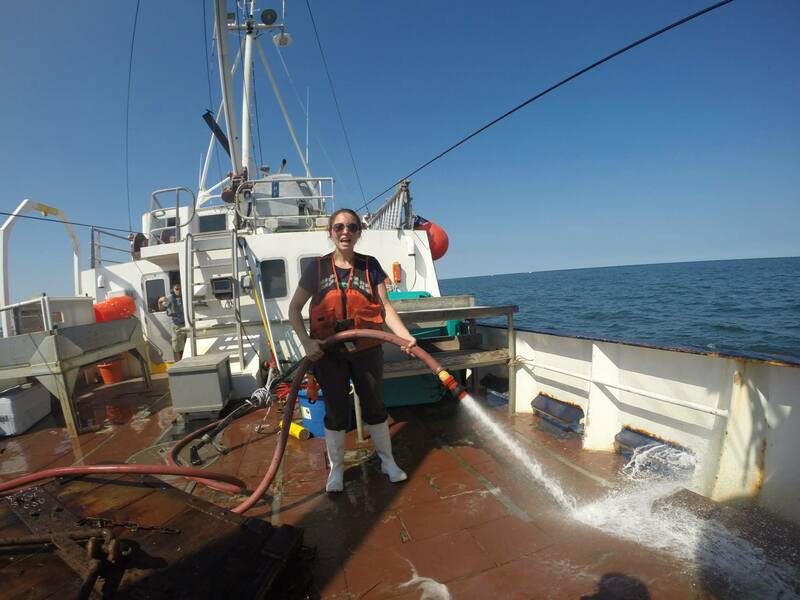 During her undergraduate years, Emily built a geodatabase smart phone application using ArcCatalog, ArcMap and ArcGIS online that collects trawl data in Great South Bay, NY for the Nye, Cerrato and Frisk Labs. She also worked on projects in which she created solar-powered PIT reader antennas for aquaculture-reared snook, with Dr. Nate Brennan at Mote Marine Lab in Sarasota, FL (Link, Link, Link), prepared samples for the isotopic analysis of trophic levels of Antarctic and Fiordland organisms with Dr. Steve Wing at the University of Otago’s Portobello Marine Laboratory, and worked in Dr. Joe Warren’s Acoustical Oceanography Lab at SBU. 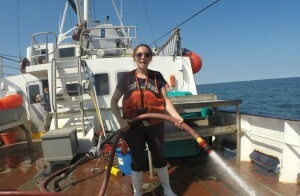 Emily has also served as a crew member on the R/V Seawolf with Captains Chris Harter and David Bowman, where, among other trips, she assisted the New Jersey DEP in preforming recreational stock assessment trawls (Link). Emily served 2 years as president of the SBU Marine Science club. Through the club, she led an educational outreach program about marine plastic pollution and a public awareness program, with Pew Charitable Trust (Link), to stop waste of Bluefin tuna from longlining. She was also privileged to study abroad in an SBU/University of West Indies program in Jamaica and in New Zealand at the University of Otago. Emily has also been honored by the Evan R. Liblit Memorial Scholarship (Link), the SBU–Mote Marine Lab Fellowship (Link), the New York Times Sons and Daughters Scholarship, the Undergraduate Student Leadership Award and by acceptance into the SBU Sigma Beta Honors Society and the SBU Golden Key International Honor Society. In my spare time, I enjoy SCUBA diving, sailing, cooking, and hiking.